The Truckee Historical Society is presenting a day of speakers and exhibits at the Joseph Research Library, August 4, 2013 from 10:00am to 4:00pm. 1883 Truckee looking north toward Cemetery Hill from above the Cottonwood. Topics and presentations include Truckee's railroad history, local ice industry, mining, and Old Hwy 40. Old photographs will be available for sale. 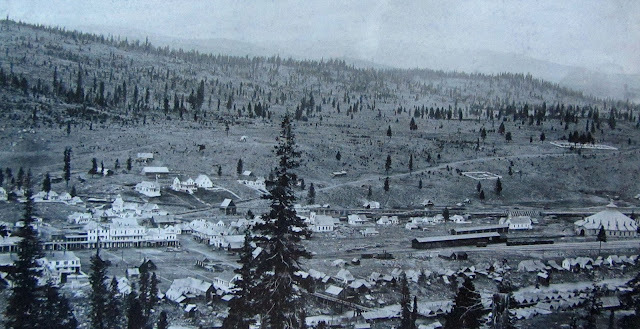 Truckee was established as a Tavern and Way station at the convergence of two wagon routes in 1863. The town was known as Gray's Station and then Coburn's Station before being officially renamed to Truckee in 1867. The Joseph Research Library is located at 10115 Donner Trail Road. (530) 559-2378.